CHICAGO, Sept. 27, 2016 /PRNewswire/ -- The Physician-Patient Alliance for Health & Safety (PPAHS) today released the second part of an interview with Thomas W. Frederickson, MD, FACP, SFHM, MBA - lead author of the Society of Hospital Medicine RADEO guide ("Reducing Adverse Drug Events Related to Opioids"). The guide is a comprehensive clinician manual created with the aim to decrease opioid-related adverse events in an inpatient setting. This is a 2-part interview about the Society of Hospital Medicine comprehensive guide, "Reducing Adverse Drug Events Related to Opioids" (otherwise known as the RADEO guide). In the first part, which can be found at https://youtu.be/cAEhjSkPkKM, Thomas W. Frederickson MD, FACP, SFHM, MBA discusses assessing patients for risk of respiratory compromise. 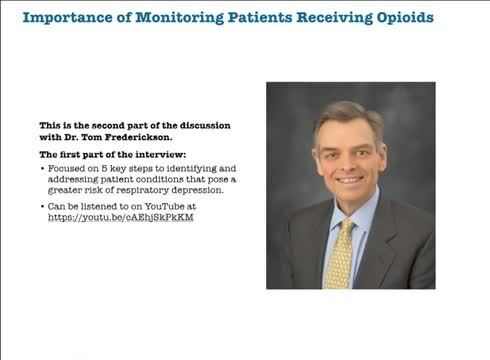 In this second part, Dr. Frederickson talks about monitoring patients receiving opioids. In the first of this two-part interview, Dr. Frederickson discusses five key steps to identify and address patient conditions that pose a greater risk of respiratory depression. For readers that have yet to listen to the podcast, please click here; it's an insightful interview relevant for any clinician working in quality improvement or directly with patients prescribed opioids. "[I]n opioid-induced respiratory or opioid induced respiratory failure, decrease in the oxygen saturation is a late marker rather than early warning sign. So, if you're monitoring oxygen saturation as a strategy to detect respiratory failure early, you have to understand that it's not an early warning sign - in fact is a late sign. So, if you add oxygen supplemental oxygen it delays that effect even further." According to Dr. Frederickson, a key to accounting for such lagging indicators of respiratory depression is the development of a comprehensive monitoring strategy, including pulse oximetry and capnography. During the interview, he highlights the unique advantages and limitations of these monitoring technologies. "Certainly, the limitation that we just talked about - decreased oxygen saturation tends to be a late marker of respiratory failure, not an early marker." "[I]t gets at more of the early warning signs of respiratory depression and respiratory failure. It approximates that minute ventilation that we talked about, by looking at the approximation of end tidal CO2 and kind of continuously monitoring the respiratory rate. So, it does give you a little bit of an insight - more of an insight than pulse oximetry would to what's happening in terms of early warning for impending respiratory failure." Dr. Frederickson ends the interview by talking about what studies have revealed about three clinical patterns of unexpected hospital deaths. Most importantly, he emphasizes that opioids can play a part in all three patterns, with overlapping mechanisms of action. To listen to the second part of the interview on YouTube, please click here.